As the FIFA fever rages on, it is a debutant that made news … it is not any person, but a new technology that hit prominence when France doubled its lead against Honduras. It happens from time to time in football: thousands of people filling a stadium watch the ball cross the goal line, but the most important of them all – the referee – hasn’t seen it. Those thousands are aggrieved, the goal is not given, and the whole course of a tournament or league competition is not what it might have been. Or perhaps the referee does award a goal – one that the defending side insists shouldn’t stand. In the 48th minute of the Group E matchup in Porto Alegre on Sunday, France forward Karim Benzema rifled a left-footed volley off the post that rebounded back across the goalmouth and off Honduras goalkeeper Noel Valladares. The keeper appeared to accidentally knock the ball across the goal line, barely. There was the briefest delay before officials signaled that a goal had been scored on the play but Benzema and his France teammates were soon celebrating a 2-0 lead. It was awarded by the referee after goal-line technology - introduced for the first time at this World Cup by FIFA - instructed him the ball had crossed the line. Replays inside the stadium led to boos from some supporters, as the big screen flashed up 'no goal' for the initial effort that hit the upright, then 'goal' after the ball had cannoned off Valladares. Do you remember the little Master Sachin Tendulkar’s tryst with the technology ? France benefited from the first decisive use of goal-line technology at the World Cup when the team was awarded a goal in its match against Honduras, which the French went on to win 3-0. With France leading 1-0, Karim Benzema's shot hit the far post and rebounded to Honduras goalkeeper Noel Valladares, who fumbled the ball into the goal. The seven video cameras trained on the goal established that the ball had briefly crossed the line by a few inches, alerting the referee on his watch with a flashing "GOAL," before the ball was pushed out again by Valladares. With any new system there is bound to be doubts and skepticism on acceptance – here too, there was some confusion seconds before when the system showed replays of Benzema's shot hitting the post with the verdict "NO GOAL" before continuing to show the actual goal. The change infuriated the Honduras players, some of whom remonstrated with referee Sandro Ricci, while Honduras coach Luis Suarez bickered with France coach Didier Deschamps. At the end of the match, they hugged and made up. 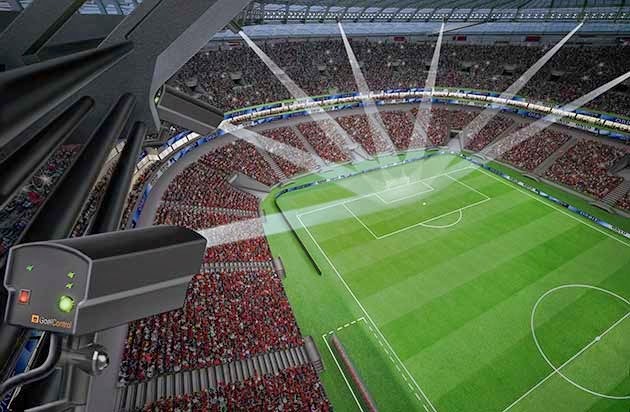 The technology is being used for the first time at a major international football tournament. Honduras protested and the replays led to confusion but the goal was awarded, four years after the incident in South Africa that led FIFA president Sepp Blatter to change his mind on technology. It was a shot from England's Frank Lampard that flicked off the bar and bounced down a yard over the line in their quarterfinal with Germany but the goal wasn't awarded. It is ‘Hawk-Eye’ the system already employed by other sports such as tennis and cricket, that is being tested now in football. It uses a network of high-speed video cameras to track a ball’s position at a given time via triangulation. The system’s software can also predict the future path of a ball – it’s often used like this in cricket to determine whether the ball would have hit the wicket had it not hit the batsman first, and the predicted path can be drawn on-screen. As used in tennis, Hawk-Eye has a margin of error of just 3.6 mm, better than the 3 cm required by football’s governing body, FIFA. The Goalref system, which has been tested in the Danish Superliga and at the 2012 Club World Cup, makes use of electromagnetic induction. A passive electronic circuit is embedded into the ball between the leather outer layer and the inflatable centre. An electromagnetic field is created in the goalmouth and its strength monitored by computer. Way back in June 2010 - England played their bitter rivals Germany in the first round of the World Cup knockout stages. Frank Lampard fired a shot over Manuel Neuer in the German goal, the ball cannoned off the underside of the bar and clearly bounced behind the line for a goal. England celebrated but Uruguayan referee Jorge Larrionda waved play on ignoring the English protests. FIFA were so alarmed by the mistake that the drive for goal-line technology became irresistible. Fifa president Sepp Blatter apologised to the Football Association over Frank Lampard's disallowed goal. in England's World Cup defeat by Germany. The high-profile error sparked a clamour for referees to be given more assistance, with international players' union FifPro leading calls for goal-line technology to be introduced. In every game, technology when available must be put to use and in football, goal-line technology the latest method used to determine when the ball has completely crossed the goal line with the assistance of electronic devices and at the same time assisting the referee in awarding a goal or not – for sure would become popular overlooking human errors changing the course fo the game. The objective of goal-line technology (GLT) is not to replace the role of the officials, but rather to support them in their decision-making. The first match to use the Sony-owned Hawk-Eye goal-line technology was Eastleigh F.C. versus A.F.C. Totton in the Hampshire Senior Cup final at St Mary's Stadium, Southampton in England in May 2012. FIFA began testing goal-line technology and approved its use in 2012. There is the smart watch now in use. The device can be used only to determine if the ball has crossed the line, and referees must be notified within one second. The smartwatches used in Brazil are made by a German company called GoalControl, which installs 14 cameras that track the ball around the pitch. It was first used in the FIFA Confederations Cup last year, a tournament that passed without goal-line controversy. Now Answer to the Q : though every Cricket lover is now well aware of Third Umpire – the concept debuted in Test cricket in November 1992 at Kingsmead, Durban for the South Africa vs. India series. Karl Liebenberg and Cyril Mitchley were TV umpires in this match. Sachin Tendulkar became the first batsman to be dismissed (run out) by using television replays in the second day of the Test when on 11. In the twilight of his career, in the series against West Indies, Sachin Tendulkar's dismissal for 10 in the first innings of his penultimate Test helped DRS's entire case. Almost as soon as the English umpire, Nigel Llong, gave Tendulkar out to the West Indies spinner Shane Shillingford in Kolkata, doubts were cast on the decision. The ball hit Tendulkar high on the pad and the HawkEye gizmo on the television coverage almost immediately showed that it was going well over the top of the stumps. But Tendulkar had no right to ask for the verdict to be overturned because India have steadfastly declined to use DRS. In the recent Ashes, Hot Spot camera combined with instant Snicko, a pairing that perhaps had the same potency of great pairs like Jeff Thomson and Dennis Lillee.